I’ve never eaten the sort of paella which contains shellfish and sausage, but I’ve eaten a fair few vegetarian versions and this one is my favourite. It comes from “Jump Up and Kiss Me” which is a vegetarian cookbook containing lots of recipes based around chilli. This paella succeeds because it takes fennel seeds, artichokes and chestnuts to replace the taste and texture of the sausage and fish. I really like chestnuts and apparently they’re the only nut to contain vitamin C, so I’m always glad to find recipes that use them. 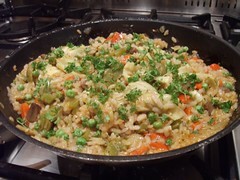 This paella also has a medley of peppers, peas and olives, and an underlying taste of chilli, basil, oregano and saffron. It’s packed full of flavour and so not for the faint hearted, but I thoroughly enjoy it with a glass of rioja! This entry was posted in Jump up and kiss me, veganmofo and tagged veganmofo by efcliz. Bookmark the permalink. Mmmmm…Chestnuts in Paella – what an awesome concept. This sure does look delish! ooo artichokes and chestnuts, I hadn’t thought about that. It sounds good. I’m not a vegan but that paella looks very tasty. I don’t eat shellfish anymore so I think I will try to search for this recipe. Thanks.